In preparation for christmas each year i make something whether it be a wall hanging, placemats or lap quilt… This year i decided to join a christmas 6″ block swap. We sent out 100 squares to 50 people 2 per person. and got back the same… I joined 2x so i have enough squares to make 2 lap size quilts. these are the fabrics I sent. I went to my local Quilt shop and purchased background for both after seperating the fabrics, I chose a gray and a green.. The one with gray will be all Poinsettia green/ red and the one on green is all the leftovers so being there was a lot of novelty quilts i decided on a fun theme. How this started is by making Half square triangles by drawing a line diagonally on the back of the green background fabric and sewing 1/4″ on each side and cutting on the diagonal. I sewed these block into pinwheels. Since i had joined 2x I actually had 2 squares so work with enabling me to make a full pinwheel. My layout is 5 across and 5 down. 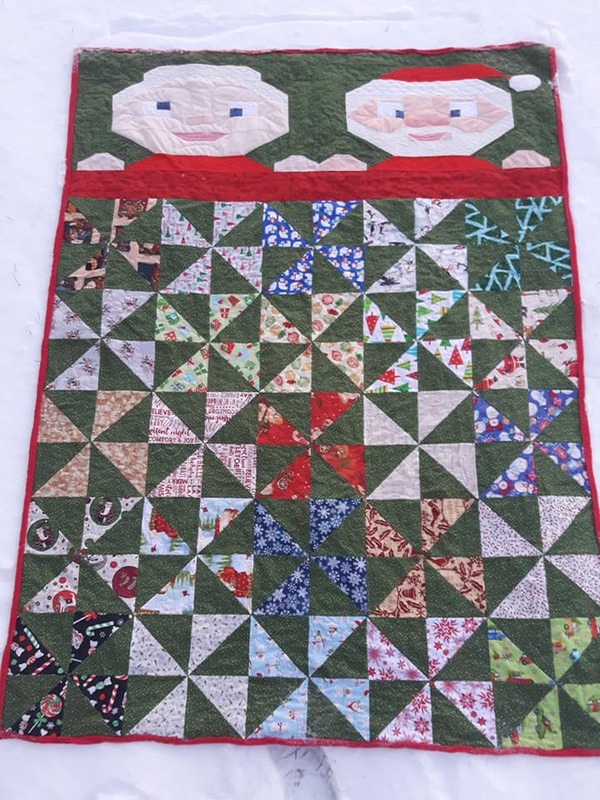 I don’t like square quilt so decided i needed something to add to the top to make it larger…One year our Pins and Pine Needles Quilt guild made raffle quilt using snowmen under a blanket so i fed off that idea. Pattern called. ‘Under the stars’. By the Rabbit Factory. I then went to my Eq program to design something to use instead of snowmen. I thought Santa and His Mrs would be appropriate for this… Here’s the eq design. It took me over 3 hours to make Santa as each piece of his cheeks and beard are one piece.. It was made using Y and inset seams… Mrs Clause went much faster. Yesterday I finally finished quilting…I call it Big days commin’…get some rest. Previous I’m thankful to be able to sew with mom..